Compost Barrel or Compost Turner? Which is Best ? A Compost Barrel or Compost Turner? Compost barrels, compost drums and compost turners: If you want an easy life but you are prepared to compost your kitchen and garden waste, a ready-made compost barrel or compost drum or even a compost tumbler might be the answer. They are also useful for storage of materials for building a compost heap. There are lots of designs on the market to choose from. Below I review some of the main types available for domestic use. If you are interested in product reviews I am adding them at the bottom of the page below. If you have a product review you would like to contribute, please use the contact page to submit it. Thank you! Here are a few tips to help you choose wisely as part of your green living lifestyle! * Make sure it is vermin-proof. * Buy one that is durable - UV stable if it is plastic. * Get one with a stout rain-proof lid. First, make sure that your compost barrel is large enough for your needs. This is important if you want to compost effectively. If you only want it to store composting materials until you get around to building a proper heap, you might be able to manage with a modest sized one. However, if you want the compost bin to do the whole job, breaking down the contents into usable compost, then you will need quite a large one. Small ones just cannot heat up enough. Most commercial bins are not really big enough to compost material effectively in a reasonable time. 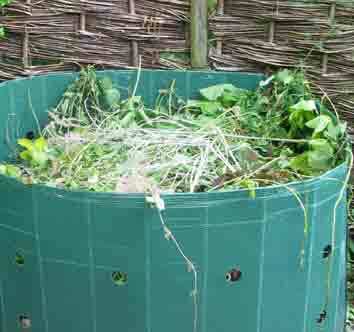 Another thing to consider – does the compost barrel have a strong rat-proof base? Rats live practically everywhere on the planet. If you put out any cooked scraps or any food that is not completely rotten, they will be in there if they can. Other animals will have a go too. So your compost bin needs a stout base and lid. The lid should also be rain proof. There should also be a hatch to remove the compost when it is ready. This should be reasonably stout and well-fitting as it also will need to be rat-proof. Next, check the durability of the product you are thinking of buying. Is it soundly made? If it is made from plastic, make sure that it is the type which withstands sun and temperature changes – (UV stable) - most will be. Is there a guarantee? Some will be guaranteed for 5 or more years. Many will be made from recycled plastics. Compost bins made out of recycled plastics are usually very durable - this is not a second class option! If you buy a cheap plastic barrel which is not designed for the purpose as a temporary solution, keep it out of direct sunlight. We don’t want to fill the landfill sites full of derelict plastic compost barrels – that would be a bit of a mini eco-disaster! A proper compost barrel should be made of thick, UV stable plastic, preferably from recycled plastic. In Britain quite a few councils are offering discounted bins to the public as a way of helping everyone to reduce the compostable contents of their kitchen refuse. 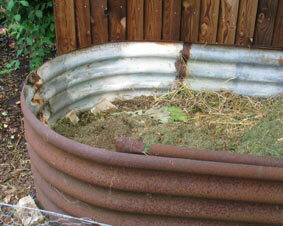 This compost bin has been made out of an old Anderson shelter from war-time. Old galvanised metal like this is fine for collecting grass clippings or leaves but make sure that it is kept well out of the way of children as the edges can be very sharp. You could buy a compost turner or tumbler, rather than a straight forward bin. This is where the drum is pivoted in the centre and the whole bin can be rotated by hand. The idea is that you turn the compost every so often so that it mixes quickly and breaks down faster. I haven’t yet used one of these but I understand from others that most of them are a bit too small to heat up properly. The Envirocycle Backyard Composter from Amazon is one of this type. It has had good reviews from buyers. There are also some large domestic ones available, however, which are able to cope with cooked food and meat too. Each time you add in waste you also put in some specially pelleted wood which helps the waste to compost properly. These compost tumblers are able to convert kitchen waste in about 4 - 6 weeks. They are not cheap. This more sophisticated type of composter is worth while if you are serious about composting and want a relatively convenient and efficient solution. So, if space is at a premium and you want a tidy solution to composting, a tumbler might be a good alternative to a conventional compost barrel but don't expect miracles. And if you want something that really works get one of the bigger, digester types described above. I believe a Swedish company makes them. You can also buy cheap plastic compost bins which don’t have a lid or a base. They are round and quite wide and deep, so they work reasonably well. They have holes in the sides for ventilation and rods for positioning and support. You can find these in big garden centres. They are good for storing composting materials. If you want to use them as a proper bin then you would need to add a cover for warmth and rain protection. If you want a good bin for leaf mulch, this type of bin is ideal. See here for more on organic mulches from leaf litter and other sources. Personally I think plastic compost drums are a bit ugly, but quite acceptable for an odd corner of the garden or yard. If you use your bin mainly for kitchen scraps you will want to position it somewhere close by your back door. You can add materials as they become available. If you keep a kitchen compost bin just throw the contents into your outside bin whenever your kitchen bin fills up. Add some fibrous material such as brown paper bags so that some air is incorporated in the mix. This will stop things rotting down into a sludgy wet mess. You can use newspaper but the print used in coloured newsprint is not suitable - it contains too many toxic elements. Many modern newspapers use soy-based inks which are non-toxic. You would need to check with your newspaper company to be sure. Compost bins can be popular with fruit flies and other flies. To stop flies building up inside add a covering of soil from time to time. You can also add more roughage in the form of paper or cardboard. Add these not-so-attractive ingredients last so that the vegetable and fruit matter is shielded from the attention of flies to some extent. It also helps if you empty your kitchen waste into the bin at night. This does not deter the flies but any flies are less likely to be active, so they are less bothersome. There are also wooden compost bins on the market. These should come ready pressure-treated with an anti-wood rot product, again one which is environmentally-friendly. They should also be made of durable wood, preferably hardwood or strong plywood. Most bought wooden compost bins are not really big enough to allow fast break down of the compost materials, so they may be better suited to being used for collecting materials in a tidy way until they are needed. Some of the better ones have easy access to one side so that you can remove the contents easily. They also tend to be more expensive. Good maintenance is essential to prevent the whole thing from rotting, along with the contents. This one I bought on a discounted scheme from a garden centre which was being subsidised by the local council. The bin was therefore fairly cheap (£20.00) but did not include a proper base at that price. The whole package of bin, base and lid came to less than £30.00. The base, which is fairly sturdy and has good drainage, is constructed so that the bin sits on it and thus maintains its shape. There is a small hatch for accessing the goodies within. The hatch does not attach very well, only having two light flaps of plastic to keep it in place. We found that it was difficult to put back after it had been removed (you have to remove it completely each time you want to remove stuff). It is easy to fill - just remove the lid and throw in the scraps. After two years use (without emptying) the whole thing started to collapse forward. This was partly my fault for not siting it on absolutely flat ground. The gradient was very slight indeed but the plastic was not rigid enough to cope with the pressure of the contents. It was only 3/4 full at the time. The next one I buy will be more solid. After it collapsed we were able to empty it and reshape it by mauling it about on the ground so that it eventually returned to its approximate original shape. We were then able to put it back onto its base so it should carry on working for a few more years.